It feels rather wonderful to be finished one project in particular this week as it's number one on my 'five WIPs to be completed before end of 2015' list. I completed the top back in April for my son's 30th birthday. 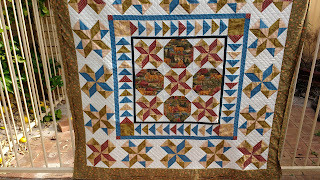 But didn't manage to quilt it until now. 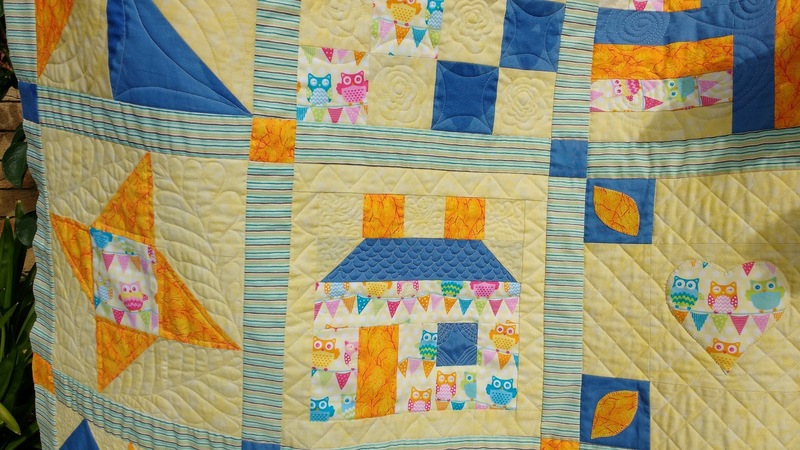 I have been quilting it since before August but there's a lot of quilting in this one. It began with a fat quarter of feature fabric with deer on it - that's the snowball blocks in the centre. It grew from there and the first dark border is a piece of leftover fabric from a quilt I made for him when he was around 17 I think. I keep my scraps for a LOOOONG time. The geese came together well but there was some creative maths in getting the spacing between the outer blocks I can tell you! Then I spent some time drawing (with a blue wash out type pen) lines to make the cross hatching in that outer border. The wadding is bamboo, which, if you didn't know (like me until I tried it) is quite heavy. So moving the quilt through my machine was quite an effort. But I'm pleased with it now, just to hand sew that binding down and add a label, then it's truly finished. It's a 62inch square, so nice to snuggle up with if you're in a different Hemisphere to us at the moment where today's temperature is 33degrees Celsius. My second finish (which I realised didn't even make the list of 5 to go!) is a sampler I made earlier in the year to teach a group of women who had never done sewing before. They have had a great time and I hope to show a photo of their efforts a little later. 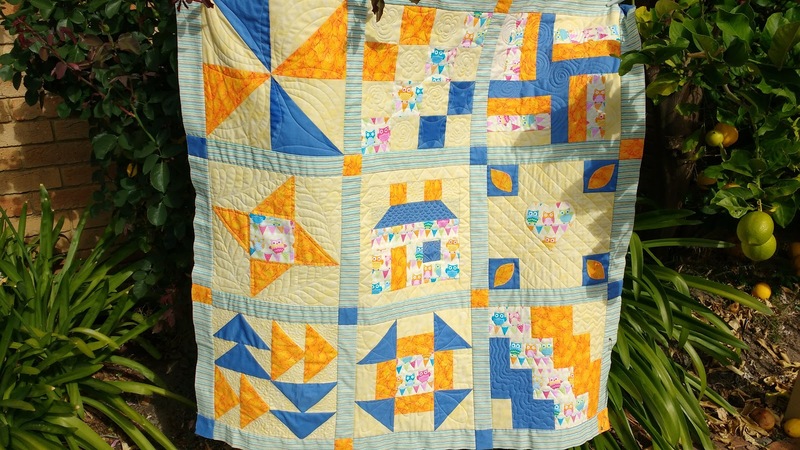 They are trying 'quilt as you go', rather than quilting the whole thing together. 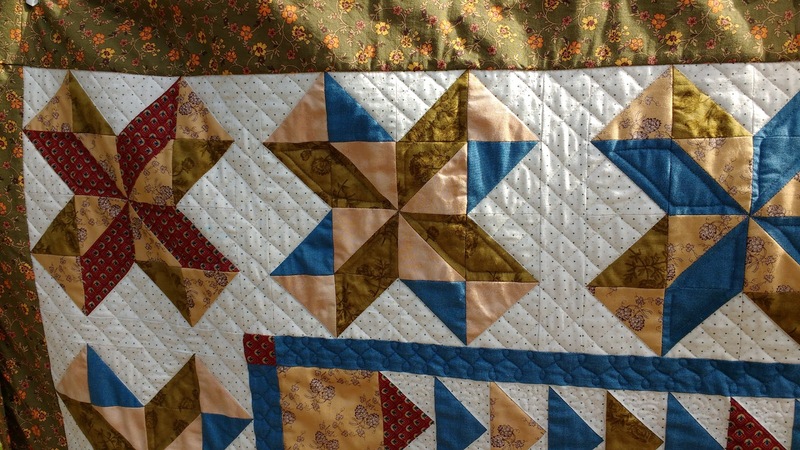 This was much lighter, being cotton and also 20 inches smaller, a 42inch square. 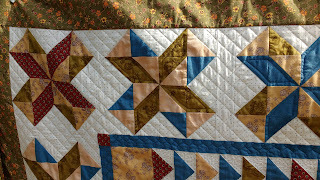 I had great fun with the quilting too. 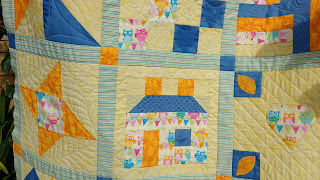 This centre row of blocks with the house, friendship star and applique is my favourite. I was trying for the effect of curtains in the window, but we all laughed as I pointed out they look more like cobwebs - which is what happens when you get addicted to patchwork, housework comes much further down the priority list. A 2 1/2" scrappy square top that I've had done for longer than I remember (at least a couple of years I think) but it's for me so ends up on the bottom of the list. A log cabin where the strips are 1" wide, so it takes patience. I'm about half done with the blocks. 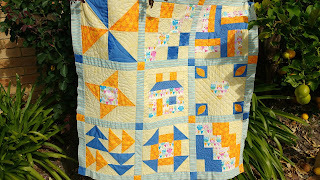 What I call 'Bugs' quilt, not the bunny sort, but the insect sort, due to the feature fabric in it. It needs some more borders to complete the top. 'What colour is Indigo?' this was a question posed by my husband. In reply I put together two Moda charm packs and added a little more. That needs its final borders and the top is done. So it sounds manageable, as long as I don't sneak in any more placemats (did 6 recently but the panel was on special and they look good) or table runners (the Christmas one I have begun to quilt will be really quick too). Beautiful quilt, lots of great energy here and thanks for sharing it!